Since 2012, Massachusetts has allowed patients to obtain medically necessary marijuana. The Massachusetts Cannabis Control Commission (the “Commission”) licenses these dispensaries as Registered Marijuana Dispensaries (“RMD”) within the state. An RMD is responsible for dispensing, cultivating, and processing marijuana for medical use. At this time, the Commission is not limiting the number of RMD that will be approved, as long as the applicants demonstrate compliance with the law. Who is eligible to distribute medical marijuana? 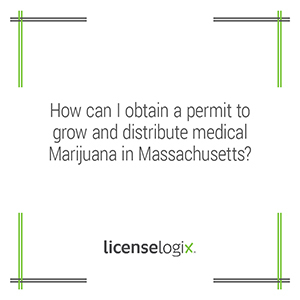 In order to be eligible to distribute medical marijuana in Massachusetts, the applicant entity must be incorporated in MA and in good standing. All employees must be at least 21 years of age with no history of narcotics or weapons convictions. All applicants seeking a license to distribute medical marijuana can be subject to an initial application phase, followed by subsequent phases should the state invite the applicant to advance. Typical attachments for the initial stage may include a letter of intent, proof of incorporation, and financial records. Attachments for subsequent stages involve a Certificate of Good Standing, a copy of the corporation’s bylaws, background checks, floor plans, and a letter of support or non-opposition from the municipality/county in which the applicant would like to locate. Applications are accepted on a rolling basis and the length of the review process varies, depending on the number of applications the Commission is reviewing at a given time and also the accuracy and completeness of the application itself. The initial Application of Intent fee for an RMD is $1,500. The next step, a Management and Operations Profile, which includes extensive background checks, has a fee of $30,000. Massachusetts issues RMD licenses for one year, after which they must be renewed. Renewing your license entails paying an annual renewal fee and submitting the required accompanying documentation to the Commission no later than 60 calendar days prior to the expiration date. How can LicenseLogix help me? LicenseLogix will research the medical marijuana licensing requirements specific to the state and local jurisdictions in which you plan to do business. Your Account Manager will prepare, review, and submit the required business license applications on your behalf, saving you time, money, and frustration. Once all of your licenses have been issued, we ensure that you renew on time and your license never falls out of compliance. Let the experts at LicenseLogix navigate the complexities of the emerging medical marijuana field. Live chat with one of our experts now, or call (800 292-0909 today!